My mom advised me to always be on the lookout for Grendha shoes and sandals in classic styles because we've proven how durable they are. They're made of molded plastic which also makes each pair very comfy and wet weather-friendly. The first few pairs we bought about four to five years ago are still pretty and wearable--I even wore one of my oldest Grendha sandals when I went trekking in Sagada. These babies are tough, I tell ya! 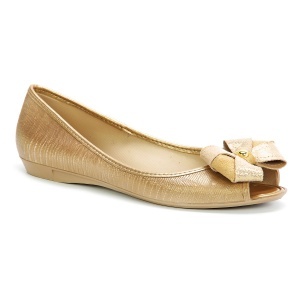 That's why when I spotted the Grendha Lisboa peep-toe ballet flats (above) last weekend, I knew I had to snap them up! My shoe rack welcomed the beige version, which I'm pretty sure will be among my regular favorites for a long, long time. For those in the Philippines, Grendha is available at Shoe Salon. Click here for the list of branches.